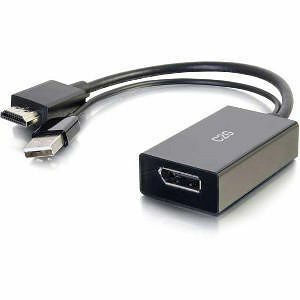 The HDMI to DisplayPort Converter 4K30 is a perfect solution for connecting devices with an HDMI output to a display with a DisplayPort input. This converter is ideal for audio/video presentations in schools, meeting rooms and huddle spaces. This simple, plug and play converter does not require software or drivers for install, and the device is powered through USB--so no additional power adapters are needed. The compact, light weight design makes it easy to carry for travel or on the go. This converter carries a digital audio/video signal, supporting up to a 3840 x 2160P 4K30 resolution--meeting the requirements for high performance presentations. The dongle style converter provides strain relief that protects the port from damage as cords are moved.